Equal sized compartments with individual locking doors and hanging rails per compartment. Welded steel construction for added strength and rigidity. Cylinder lock with 2 keys supplied. Durable exterior with powder coated finish. Suitable for commercial, industrial, educational and leisure environments. Ventilation on back wall, along with pre-drilled holes for nesting side by side and/or back to back. Internally fitted with hanging rail & hooks. Available in a choice of 3 different door colours. 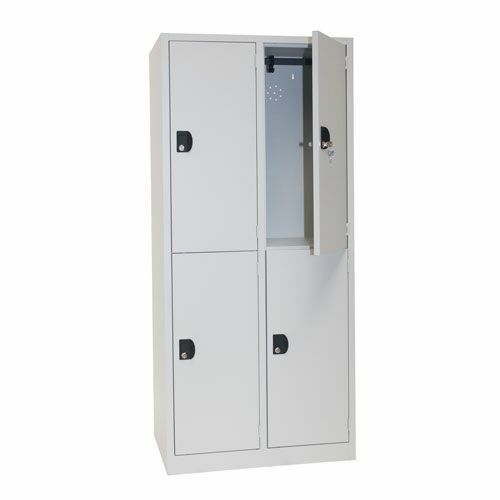 Nest of lockers with four compartments on secure plinth, with internal hanging rail and shelf.